You can find Christian jewelry in the form of a cross, a rosary, a medal, an angel, or even a coin pendant. Though you can go to local stores to shop for this type of jewelry, you can also find a great selection of Christian styles in many online specialty jewelry stores. 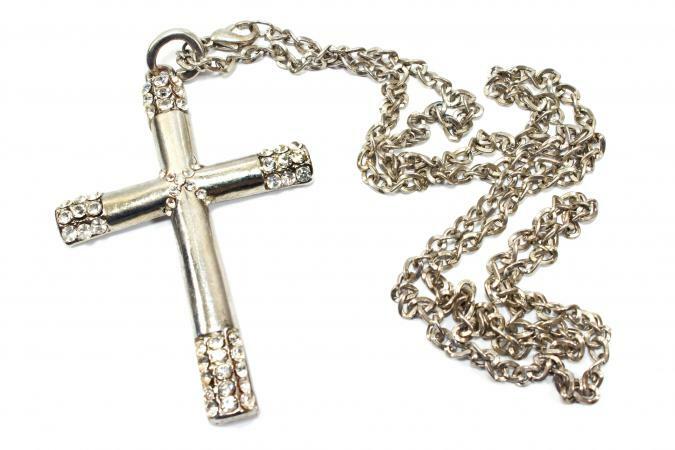 Cornerstone Jewelry: Here you'll find a selection of Christian jewelry including angels, saints, crosses, crucifixes, and more. Catholic Family Catalog: Do you need a rosary or a chaplet? You'll find them here. There are also crucifixes, medals that feature saints, and more. Mardel: This site has one of the widest ranges of Christian jewelry out there. There are chastity rings, watches, crosses, alpha and omega, scripture, and more. Etsy: This is a good place to find Christian fish symbol jewelry as well as other pieces that express the faith. Christian Book: Find jewelry for teens, dog tag art, pendants, beads, and more. The selection here is incredible. When it comes to buying Christian jewelry, you have plenty of style options. For Christians, the crucifix is not a symbol of Jesus' death but of his triumph over all death, opening the possibility for all believers to attain heaven. Although the terms "crucifix" and "cross" are used somewhat interchangeably, there is a major difference between the two. A crucifix features an image of Christ on it, while a cross remains empty. Reliquary crucifixes are yet another variation of the standard cross. These crucifixes contain a hinged opening to carry small relics from the saints, which many wearers believe impart certain gifts and/or protection to those who wear them. You can wear crucifixes and crosses as pendants or earrings. Although technically not jewelry, Christians wear both rosaries and smaller chaplets when reciting the prayers their arrangement of beads are designed to reflect. These pieces range from the very simple to the very ornate, but each one holds a certain unique beauty. Chaplets are often the size of bracelets, while rosaries may be worn around the neck or as rings in smaller versions. Religious medals are extremely popular pieces of Christian jewelry, especially with those of the Catholic faith. 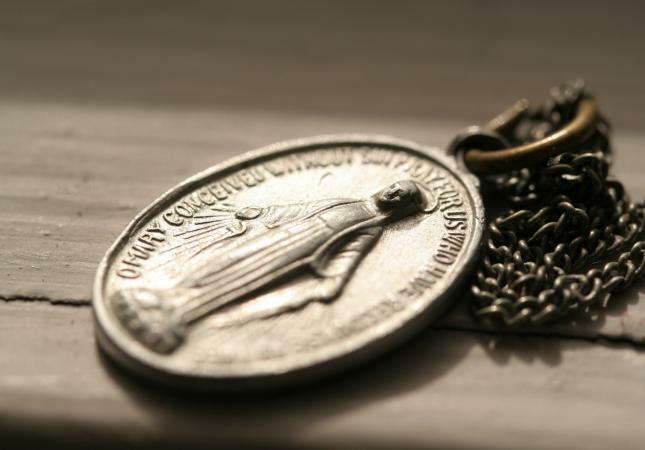 Each medal relates to one of the established saints and conveys a certain message. The Miraculous Medal is perhaps the most commonly worn religious medal of all. This piece traces its origin back to the visions of Saint Catherine Labouré, who was said to have received directions for its making from the blessed Virgin Mary herself. It's commonly believed that praying with the Miraculous Medal will obtain the intervention of the Virgin for one's cause. St. Christopher has also been a very popular subject for Christian jewelry over the years, and remains so even though his existence has been questioned by some religious officials. Today, coin pendants are mainly high-priced relics or antiques. In the days of the Emperor Constantine, coins were minted using images of Christ and the cross. Holes were driven though the tops of these coins in order to turn them into pendants or necklaces. Angel jewelry is amazingly popular across many religious sects. Angels are widely believed to be heavenly messengers as well as personal guardians, and as such have gained wide appeal. Angels appear in a wide range of Christian jewelry including necklaces, pins, and earrings. Angels also make lovely additions to charm bracelets. To understand how Christian jewelry came into being, you can look at the early beginnings of the Christian faith, because the two are entwined. In the years following Jesus' death, his followers were also persecuted and executed, leading them to take their faith underground. Christian rights were practiced in secret locations behind closed doors, and Christians themselves took great care to conceal their faith from the ruling party. Christian jewelry evolved as a means for Christians to identify each other. It was usually quite discreet in design and often concealed under clothing, only shown when a person was reasonably sure they were in like company. Although Christian jewelry is quite attractive, most people do not wear these pieces to enhance their personal beauty as they might with other styles of accessories. This jewelry is usually worn, as it was in ancient times, to make a subtle statement about one's faith and personal beliefs.